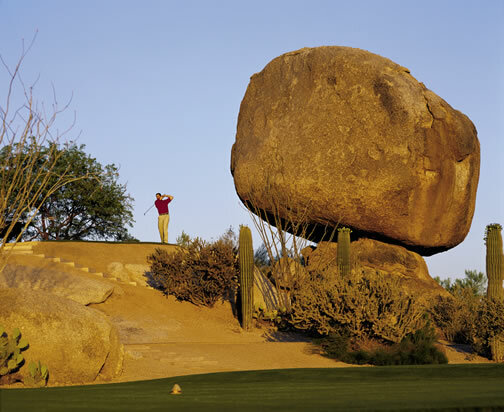 The Boulders Golf Resort is ranked by Golf Digest one of the most prestigious places to stay and golf in the country. This five star property is home to the 36 holes championship golf courses, North and South. 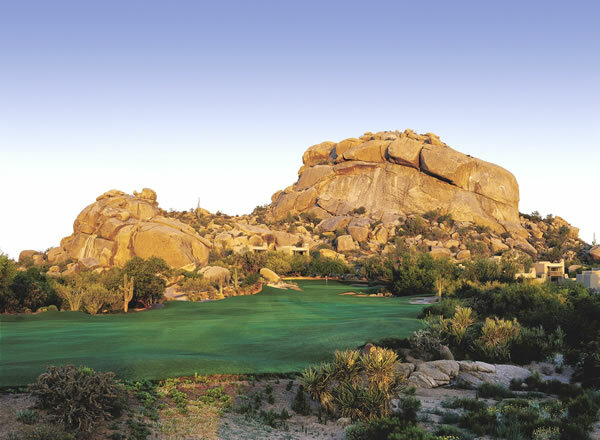 Boulders Golf Club is great for the seasoned golfer or those who love amazing desert scenery. The North Course is the older of the two golf courses, designed by Jay Morish this natural beauty boasts spectacular panoramic views of the southwest desert. Built right into the foothills of Black Mountain, Boulders North winds through striking boulder formations, passing wildlife and desert vegetation. From the start, fairways appear narrow; however, play more open towards the beginning of each hole. The South Course plays a little tougher than its sister course. The fairways begin tighter off the tee box and are lined with thick desert on both sides, which requires more strategy to score well. Considered the more scenic of the two courses some of the holes play right up towards multiple boulder formations allowing for that picture perfect moment. Two of the most famous formations, “Boulder Pie” and “Rosie’s Rock” will be made visible on this course. High elevation changes and well kept bent grass greens make this Arizona golf course a favorite amongst golfers from all over the world. From Phoenix Sky Harbor Airport: Follow the airport signs to the Loop 202 E. towards Tempe. Merge onto Loop 202 E. and continue 3.7 miles. Merge onto Loop 101 N. via exit # 9. Continue 16.2 miles and exit on Scottsdale Rd. via exit # 34. Continue 11 miles north on Scottsdale Rd., which becomes Tom Darlington Dr. Proceed 500 feet past the Carefree Highway intersection. The entrance to Boulders Golf Club will be located on the right hand side of the road.